Creativenails4fun: Do you know the Random nail art Community? Do you know the Random nail art Community? Heey, vandaag wil ik een initiatief met jullie delen waar ik zelf heel erg enthousiast over ben. Zowel voor mensen die zelf een nail art blog hebben als meiden die gewoon graag inspiratie opdoen door het kijken naar nail arts heb ik goed nieuws. Alessandra heeft een website genaamd Random nail art waar je heel veel nieuwe nagelcreaties kunt ontdekken door simpelweg op de paarse knop te drukken! 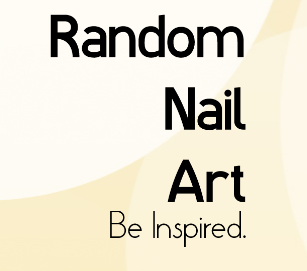 Die paarse knop leidt je dan naar een Random blog die deel is van de Random nail art Community. Op die manier kun je steeds nieuwe posts ontdekken! In dit artikel vertel ik je meer over deze geweldige website en wil ik bovendien mijn top 5 favoriete nail arts met jullie delen die ik de afgelopen tijd op Random nail art ontdekt heb. Hello! Today I'm very excited to tell you something more about a website that I discovered called Random Nail art. The website is perfect to help you discover new nail art ideas but also for people who have a nail art blog and would like to share their manicures with the world :) Alessandra has made a website called Random Nail Art where you can discover lots of these beautiful nail art creations by simply clicking on a purple button! The link behind that button will lead you to a new Random blog where you can find a new amazing Random nail art which you maybe would never have discovered otherwise! So in this article I'd love to tell you something more about this website and I'd also like to share my personal five favorite manicures which I have discovere using this site. Random nail art is een site waar je, zoals de naam al zegt, Random manicures van over de hele wereld kunt ontdekken. Inmiddels hebben al heel wat nail blogs zich bij dit netwerk aangesloten en kun je meer dan 3000 nagelcreaties op verschillende blogs met deze website bezoeken. Alessandra heeft de site opgericht om mensen nieuwe nail arts te laten ontdekken en nieuwe blogs onder de aandacht te brengen die je anders waarschijnlijk helemaal niet gevonden had. Maar hoe werkt Random nail art nu precies? 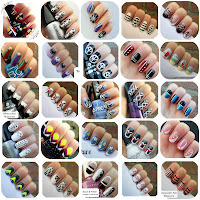 Random nail art is a website where you can find (as the name already reveals) Random nail arts from around the globe. There are lots of nail bloggers who have already joined this community and they've added over 3000 nail art creations to the website which you can discover easily. Alessandra created this website to let people discover beautiful new nail art creations and new talented bloggers which you can follow right away. But how does this website work? 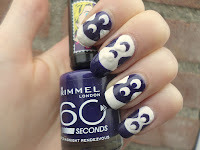 Nadat je naar www.randomnailart.com bent gegaan krijg je dit beeld te zien, waarna je door op de paarse knop te drukken naar een Random nail art blog geleid wordt. Hier maak je kennis met een van de nagelcreaties die deze nagelblogger naar de site heeft opgestuurd. Bedoeling van de site is om alle nagelbloggers met elkaar te verbinden. Je kunt dus zelf als nailblogger ook je eigen nail arts aan de website toevoegen door simpelweg een mailtje naar de eigenaaresse Allesandra te sturen, met links naar jouw artikelen! Het maakt niet uit of je 5 links of 500 links naar haar toestuurt, als het maar creatieve nagelcreaties zijn. De enige voorwaarde is dat je de manicure zelf gemaakt heb. Vervolgens voegt Alessandra de nagelcreaties aan de community toe! Als je eenmaal deel van de community bent kun je ook een button in de sitebar van je blog zetten waardoor jouw lezers ook de site kunnen bezoeken en het aantal Random nail arts kan groeien! 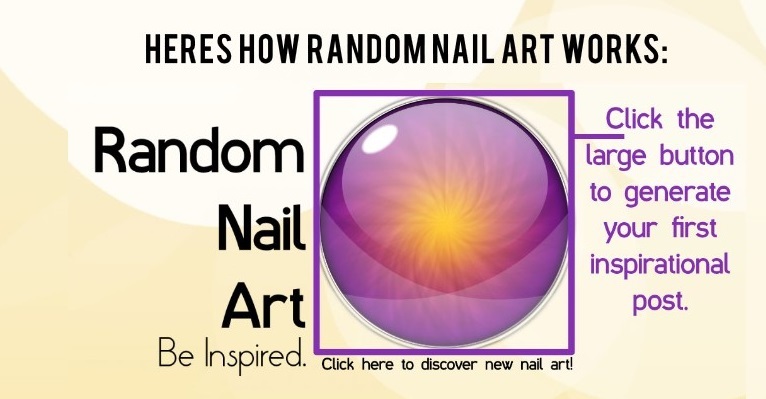 After getting to www.randomnailart.com you get to see the picture above. 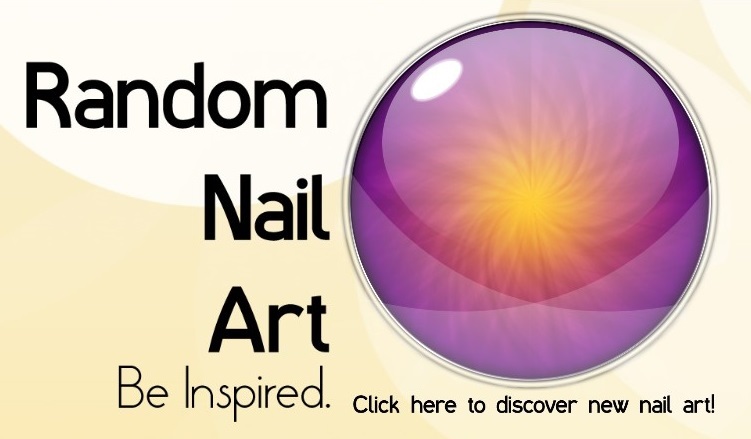 You can simply click on the purple button to discover a new Random nail art creation that someone added to the site. Purpose of Random nail art is to create a community which can link all those talented nail bloggers together. You can also add your own nail art creations to Random nail art by sending an e-mail to Allessandra with links to the articles on your blog, where you posted them. Whetter you send her 5 or 500 nail art that YOU created, it doesn't matter :) Alessandra will add your nail art creations to the Random nail art community! After sending your pictures to Random nail art you can add a button to your blog. In that way your readers will also have the oppertunity to visit this website and discover new manicures! My favorite Random Nail arts so far! Zoals jullie lezen ben ik dus heel enthousiast over deze website en ik was erg dankbaar toen ik bericht kreeg dat ook ik aan de site mag deelnemen. 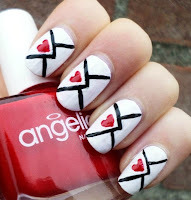 Om dit artikel compleet te maken wil ik graag een aantal nagelcreaties met jullie delen die ik de afgelopen tijd op www.randomnailart.com ontdekt heb! 1. Marine loves Polish created this lovely candy nails manicure. I think the pink and purple shades that she used to make this nail art match really well together and I think I would not be able to create a manicure like this! I think the picture looks just stunning! 2. pcontrera8nails shared this lovely skull nail art with her readers. I love all the little details that this manicure contains and I think this freehand manicure looks just soo perfect! I think out of all the manicures that I discovered on Random Nail art so far, this one is definitely my favorite! 3. Piggieluv managed to create these Dragonfly nails, and I have to say: this manicure looks perfect as well! This nail art contains a magical glow in the dark effect and I love how she adds the tutorial on how to make this manicure to her posts as well! 4. Vicky loves Nails! created this Science/Technology manicure. I love the contrast between the dark blue polish and the white shade and I think all the little details look great as well. The quality of her pictures looks just stunning and I'm looking forward to read all of her next posts! 5. Kerrucles made this purple manicure and I think she'd a wonderful job creating this nail art. I love how she managed to get the lines so perfect as they are in the picture. The purple stands out even more because of the white background! Go to www.randomnailart.com if you want to discover beautiful new manicures. You can also add nail art posts to the community yourself! Please feel free to send an e-mail to sparklysharpfabulous @ gmail . com if you’d like to add your own nail arts to the community! Omg die skulls zijn zooooo gaaf! Kan je hier niet een keer een tutorial van proberen te maken :) Zou leuk zijn! Haha ik weet niet of ik zo n mooie nail art na kan maken! I'm in love with Random Nail Art, Alessandra has created a gorgeous project and I'm happy to see it's growing bigger and bigger. I've discovered many talented bloggers day by day! Deze site ga ik onthouden! Het ziet er echt super leuk uit!! Wauw ik vind nummer 3 echt zo mooi. Al maak je altijd heel mooie creaties. Ja nr. 2 vind ik ook super! Sounds cool, I must check it out . AWW you're welcome! I hope that you continue adding those beautiful manicures to your website and I would definitely recommend taking a look at Random Nail art! Great information dear! <3 Some in a swedish nail community explained this in a post but I didn't understand anything that time, the info was then too short. the designs are so pretty! Hi Julia! Thank you so much for supporting me and for sharing this awesome new website. 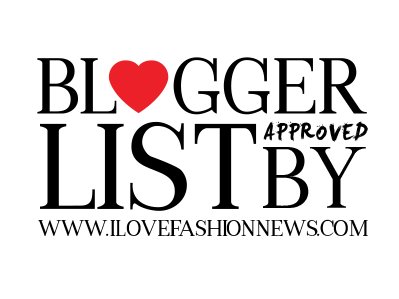 I can't wait to see other talented bloggers like you out there. Thanks for sharing amazing information with us. We would like to inform you t9th is the best packers & movers in noida. We also provide services for office shifting in noida, home shifting in noida, car shifting in noida, bike shifting in noida and all others product shifting in noida. Try our service and get best result from our side. ~Review~ Manhattan Quick Dry polishes!